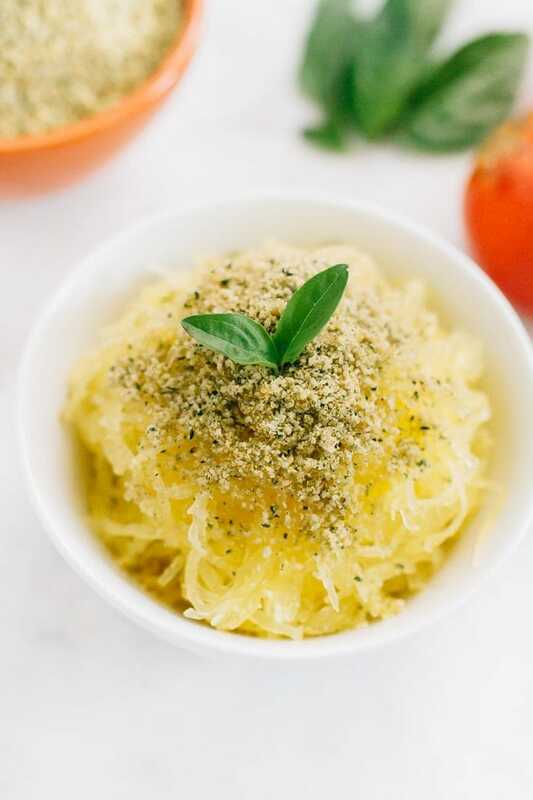 Make your own vegan parmesan cheese with hemp seeds and nutritional yeast. 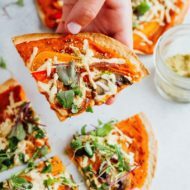 It’s the perfect dairy-free topping for pizza, pasta, veggies, salads, popcorn and more. Heyo! We’re on our way home from Portland, ME this morning, but I wanted to pop in with a quick recipe I’ve been absolutely loving lately. 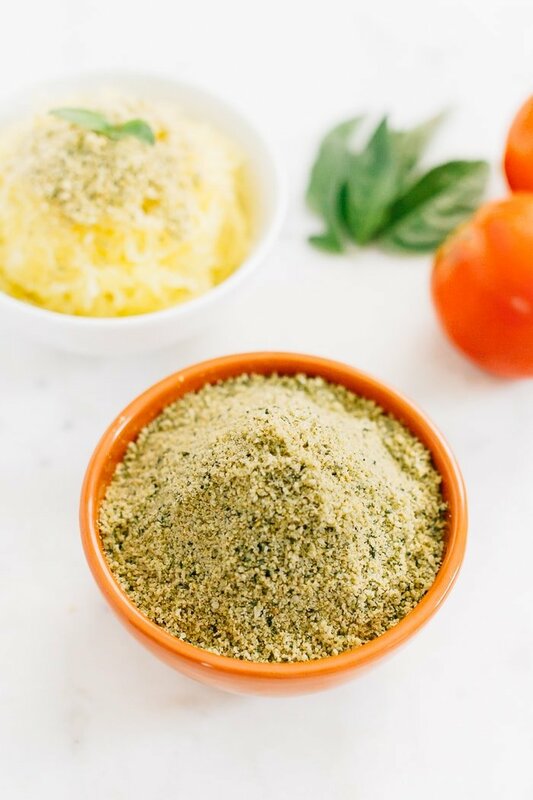 It’s a homemade parmesan cheese made with just four ingredients — hemp seeds, nutritional yeast, garlic and salt. It’s cheesy, salty and tastes remarkably similar to grated Parmigiano-Reggiano. Maria and I came up with this recipe on a whim one day while making this lemony rice salad. 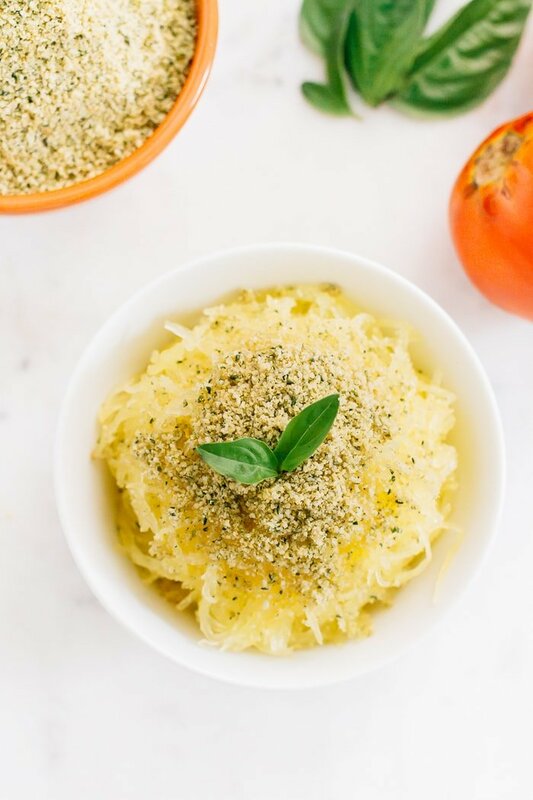 We wanted to make some sort of cheesy topping for the salad so we used this recipe from Minimalist Baker as a guide and came up with a nut-free vegan parmesan cheese with hemp seeds as the base. 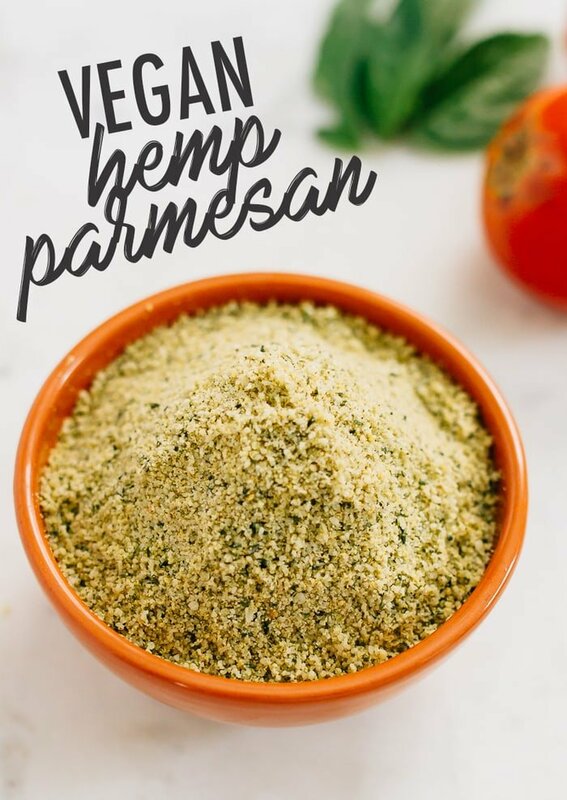 We ultimately decided to keep things simple and use plain hemp seeds as a topping for the salad, but I’m so glad we experimented because the vegan parmesan is so good! Even Isaac, who is a diary-loving cheese man likes this vegan parm. He was skeptical at first, but now he’s a convert. We’ve been sprinkling this little mixture on just about everything — pasta, spaghetti squash, steamed veggies, salads, popcorn and more. The options are pretty much endless — almost everything tastes better topped with this cheesy, salty vegan parm. And added bonus, each tablespoon has 6 grams of protein!! This recipe is super simple. 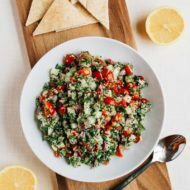 Just pulse everything in your food processor or blender for less than a minute to combine or simply stir everything together in a small bowl. Each batch makes over a cup (and a little goes a long way) so just store the mixture in your fridge and use it over a few weeks. 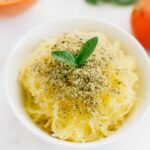 Make your own vegan parmesan cheese with hemp seeds. It’s the perfect cheesy topping for pizza, pasta, veggies, salads, popcorn and more. Add all ingredients to a food processor or blender and pulse a couple times until everything is combined. If you don’t have a processor or blender, simply place all ingredients bowl and stir to combine. 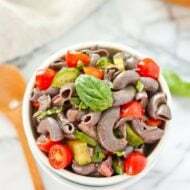 Place mixture in a sealed container and store in the fridge. Adapted from Minimalist Baker’s recipe. One quick note, you definitely need nutritional yeast for this recipe. It’s what gives the vegan parmesan that cheesy, nutty flavor you want! If you can’t find it at your local grocery store, you can grab it on Amazon. It’s worth it! PS – I just realized I’m giving you all two hemp recipes this week, but I’m totally okay with it because hemp seeds are where it’s at. Plus, I have a recipe coming soon that uses this vegan parmesan cheese so it had to be shared ASAP. Get excited because the upcoming recipe is a good one! What a healthy, delicious vegan option! This sounds great! I usually settle for just using nutritional yeast, especially on popcorn but LOVE the idea of adding hemp seeds! This looks super tasty. Love hemp seeds!! Also, I just can’t get enough of your new blog layout 🙂 It’s so pretty!!! Who designed it for you? How long do you think this would last? Or in freezer? I live alone so I tend to have to think ahead for things like this or risk wasting food which I hate! I honestly think it would last over a month! There’s nothing that will really go bad, especially in the fridge! Looks Delish! Also, I know it’s hard to put yourself out there on your blog, but I’m hoping you do an update soon on your amenorrhea journey! I know there are others, too! Thanks for the awesome blog! Hi Nikki. I’ve already started writing the next update. Just have to finish it up and post it. Coming soon! There’s clearly a green herb in the pictures, but not in the recipe. What is it? Basil or oregano would probably be good. Hi Leah! The herb is basil. It’s not actually included in the recipe for the hemp parmesan, but I agree that adding some herbs to the mix would make for a nice addition. Let me know if you try the recipe. Delicious. I’m mad about hemp and NOOCH so this looked a winner to me.